Today I'm excited to share with you my first video for the Pion Design Team. I have put together an Easter card using papers from The Easter Greetings Collection. I am so in love with the colour palette, I think purple is my new favourite!! And here is the video for you. This one is a little different because I'm concentrating on layering and using these papers in the best way possible to show off the designs. Not too much in the way of mixed media, but I hope you will still enjoy it. More rain for us here, which quite honestly, I LOVE!! Just a few shots of my walk. The all-too-familiar mark of death for a tree around these parts. It's just so sad! To the chagrin of my hubby, I have taken out all of the screens from the windows, so that I can feed the animals and take photos. A decision I will probably regret when the bugs come out to play...pretty sure there's bugs in the country, right?? Well anyway, some rainy shots taken from the window. Thank you so much to everyone for helping me identify the small brown birds as sparrows, and thank you to Julia for spotting the Mourning Dove...I never would have gotten that one on my own! I have decided to hang a bird-feeder on the side of the house, just outside the patio door and I have some takers right off the bat! I've never seen a raccoon before, so this was a real treat for me! I only had a couple of seconds to grab my camera so I didn't have time to make any adjustments to the settings. It's a horrible shot, BUT WHO CARES...THERE'S A RACCOON ON MY ROOF!! ha! Last but not least, my dear, hilarious, soaking wet Barry, eating his lunch, dangling from the screen door on the patio. He started this tradition to get away from the other squirrels, and it just sort of stuck. What a funny little guy! 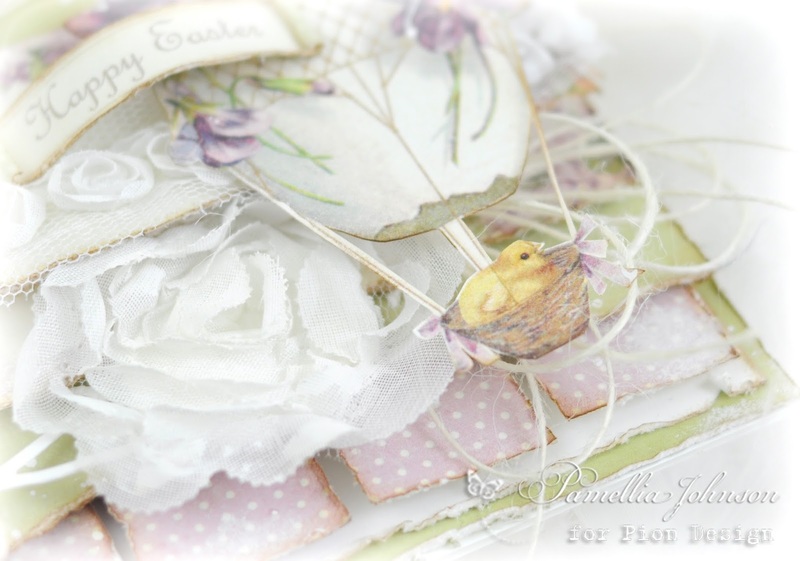 Oh Pamellia, this card is amazing - love the soft colours and the gorgeous wee chick hiding there under the egg. Love your photos - and that raccoon is such a fun shot, as for Barry - i am still smiling. 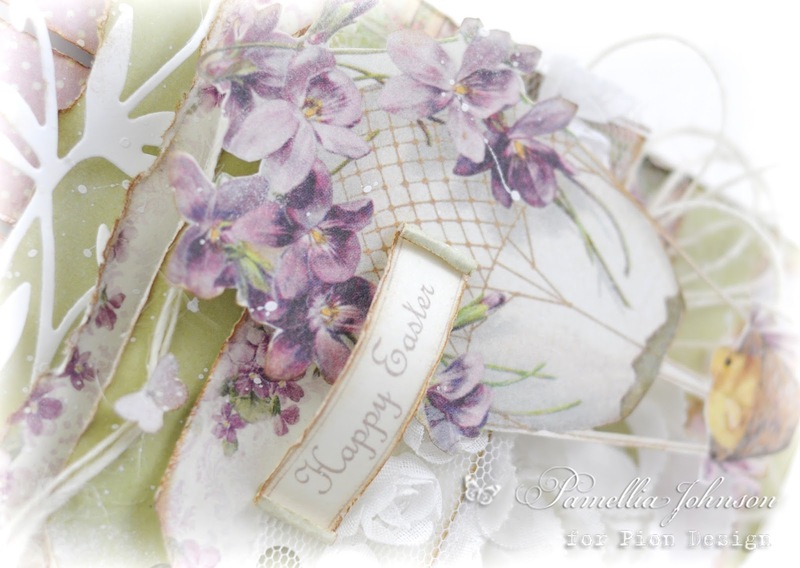 Another gorgeous creation Pamellia, lovely shades of lilac with the soft green hues peeping through the layers, it's a delight. Utterly gorgeous and so feminine is the only way to describe your card. Love your pictures, especially that nosey racoon! Loving your card, will watch the video later. Love your pics. must dash . Wow! Cue squeaky squealing!! First I watched the video - those are beautiful papers but to see your layering process was F.A.N.T.A.S.T.I.C! No wonder your layered cards always look so brilliant! Next, your walk which still looks lovely in the rain. ..then...a nuthatch...my favourite bird of all! How clever of you to hang the feeder! Barry certainly is a character too! Finally....the biggest squeal of all -a raccoon....on your roof..oh my!!!! Have a wonderful day! Big hugs, Chrisx ps hope you don't get too many bugs! A Wowser Pamellia! Thanks also for the tutorial! It's always a pleasure to visit you and been amused with the photos! Hugs! Another real stunner my friend and like always I loved watching your video. You always make it all look so easy! I love all the layers, but it's the finishing touches, like the curling of the sentiment, or that little butterfly added to the bit of twine on the tag, that are so imaginative! Oh My Pamellia. You know that song Tina Turner Simply the Best, that's you Pamellia to a T.
Oh My this is Faboulas with all the layers and such pretty soft colours, watched the Video brill. Nice pics. Gorgeous card ! loved the soft pastel color scheme and as always beautiful layering ! Oh I love seeing your photos ... A raccoon!! Yikes! I've never seen a real one... Gorgeous card as always but I think those animals are in serious competition with your creations Lol! Really beautiful card. I think violet is quite a rare color in your cards. This pastel looks sweet. Fun, I can see hte same shade in your photos, too. Thanks for sharing. Oh these colors speak to me...I absolutely adore the shades and patterns of the purples and greens. Exquisite layering and that little duckling is so sweet :) Hugs! Gorgeous Easter card Pamellia, fabulous papers, such delicate colours, and lots and lots of layering. Thank you for sharing your work with all of us at Crafty Boots Challenges. PS I think think Mr Raccoon could become a favourite of mine, he has such a cheeky face! An amazing card and I have to agree with you about the wonderful colour palette which you used in a special way..
Pion Designs...WOW!!! Congrats to you Pamellia...your talent know no bounds my friend!!!! A GORGEOUS card...love all those fabulous layers and accents! Now as for Mr. Raccoon...cute but be careful or you'll end up with him in your house!! My Aunt had some that chewed through the soffits of her roof and ended up in her bedroom...YIKES!! Wildlife Guy finally tracked one down in the kitchen and another managed to get back up into the attic! On that note...have a wonderful day Pamellia...looks like maybe some sunshine today! what a beautiful Easter card - love the hot air ballon and all your lovely layerings! Super awesome card Pamellia and such an inspiring video. Incredible video and card Pamellia, I just adore how you are transforming the Pion papers to life. And as for your little visitor the Racoon......how awesome is that ! Lovely, lovely, lovely!!!! Good night, lady... this is amazing! Thanks for doing the video... I love watching how you pull it all together... fantastic! Such a pretty card Pamellia! Love all the layered papers and distressed edges! 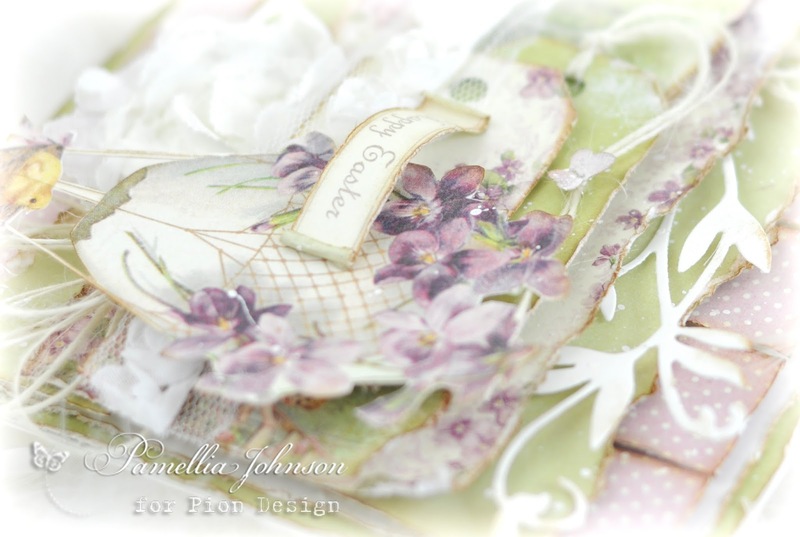 A stunning card Pamellia, so many fabulous layers and gorgeous details - beautiful colour combination, my favourite. 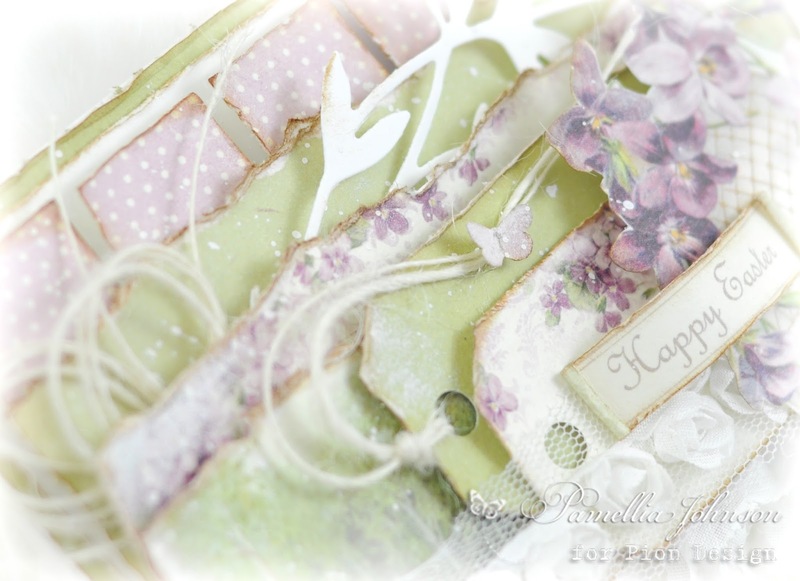 Another stunning layered card Pamellia. It was a super video. Loved todays photos, and see how you love the area where you have your home. A stunning card Pamellia, such beautiful papers and colours. have watched your video, amazing how you do all your layering up and cutting into your papers, thank you for sharing..
Beautiful card, Pamellia! I really am glad to see the video and look at firsthand all the dimension to the card. I am so glad that there is someone else who loves rain like I do (snow lover, too). I absolutely love the raccoon photo--how much fun you must have enjoying all those critters. You should know, when I found your blog I spent three nights in a row drooling over your posts all the way back to the very beginning! I was entranced with reading about all of the handmade backgrounds you detailed. I truly admire this about your work, BUT - now that I see you working with fabulous designer papers such as these I really love and admire it as well. I mean look at this egg balloon!!! How can you not want to use it?!?! It's the sweetest image and is so beautiful with all of your fabulous layers. AMAZING card, Pamellia! Absolutely awesome. So much beauty to look at. Amazing piece of art Pamelia. Oh my gosh - an AMAZING card and what wonderful impressions again... so funny with your special friends -- I laughed about your "Close Encounters of the Third Kind" with Rascal the racoon we call it WASCHBÄR..
Another stunning Easter card and a wonderful video. I love how you tear up the beautiful papers and make them even beautiful when you rearrange into your design. The little chick is just too cute and a gorgeous colour scheme. Sally.x. 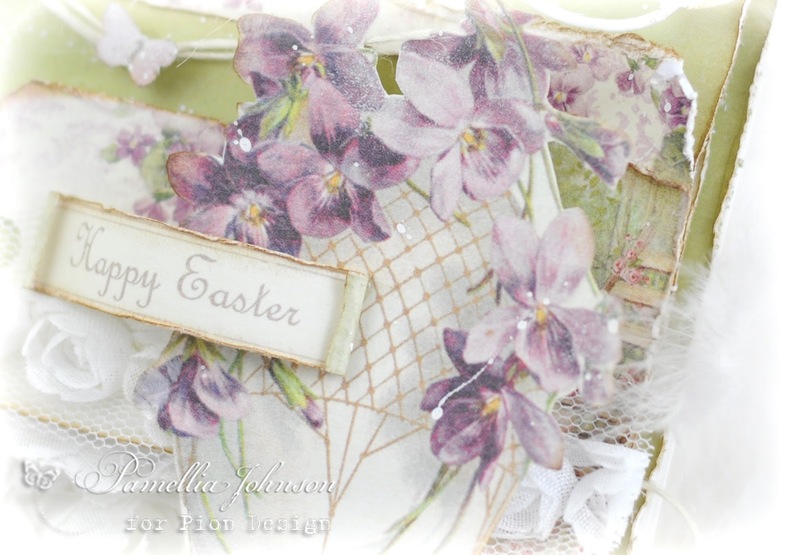 Mixed media or not...still just a beautiful Easter card, and I too, am really taken with the purples/lavenders this season. This is some beautiful paper. I know if I bought it, I would just hoard it, like I did with their Christmas collections. Love taking a walk with you in the misty rain and seeing your photos! Good for you to get the bird feeder, but I bet the squirrels and raccoons will get the lion's share! Great shot of Mr. Ricky! How adorable! They are terribly destructive, though, so be careful! Back to see the video later! It will be my little treat today, hopefully! Big hugs! another really superb creation here, and I really enjoyed the video. A couple of your videos end before you have finished, and this one was the same. I don't know if anyone else has the same problem. Love you super photos of the birds, and the park outside. Yes isn't it shame that trees have to die also, as they are our life line as without trees there would be no earth. What a very cheeky Racoon I bet he was enjoying watching your TV. LOL. Hehehehehh - love the raccoon and dear Barry!!! Heheheheh... made my day!!!! I can only imagine the shock when you saw the raccoon Pamellia - eheheheheheheh!!!!! Love rainy photos were wonderful too - loved the shots from your screenless window!! And of course, the card is just BEAUTIFUL. I didn't realize HOW beautiful until I watched your tutorial though. It really came to life then. The colors are so vivid and lovely. You REALLY highlighted that Pion Paper spectacularly. You made me want to just go buy some and I don't even use paper much!!! HAPPY EASTER sweet friend. XXj. Beautiful card as always love the colors and all the layering . Had to watch the video a couple of times to see all the detail . Wondering if you can tell me where you buy the Pion Design papers in Canada . Gorgeous, gorgeous card Pamellia, as always! The papers are so beautiful, I need to get some more! So sorry for my absence I have not been too well but on the road to recovery now. I have looked over your wonderful posts of all your stunning creations, so adore the pin box. Of course all the wonderful images have not gone a miss either, marvelous images. I do hope you are well and I look forward to seeing more stunning creations from you just like today's post and Purple is one of my favourite colours too. Absolutely stunning card Pamellia,brings Spring closer in some ways! Oooh love your raccoon,he looks a cheeky little fella that one.....be careful about leaving doors and windows open as he looks like he'd be straight in! 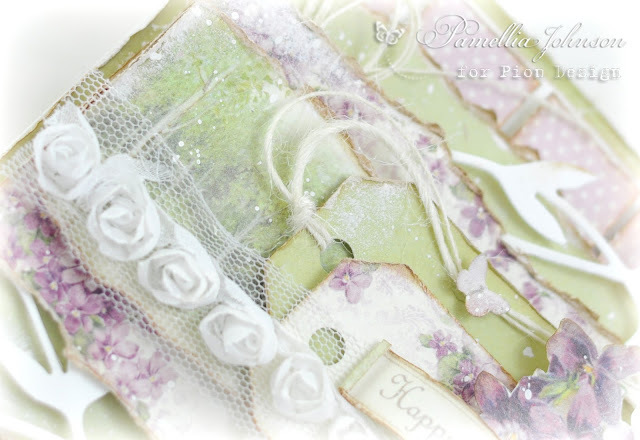 Stunning card Pamellia and the papers you've used are gorgeous! 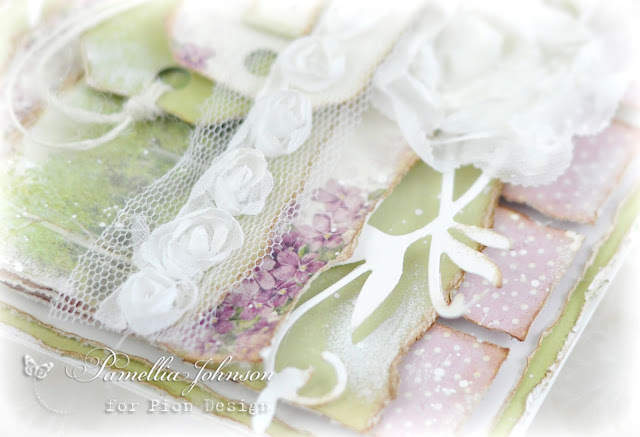 Fab video, love all the layering with the foam tape! OMGosh that raccoon is so cute! A beautiful card Pamellia and another entrancing video. You are so brave to tear those pretty papers but the end effect is wonderful. I love the way you've built up the layers and your finishing touches are all so perfect. 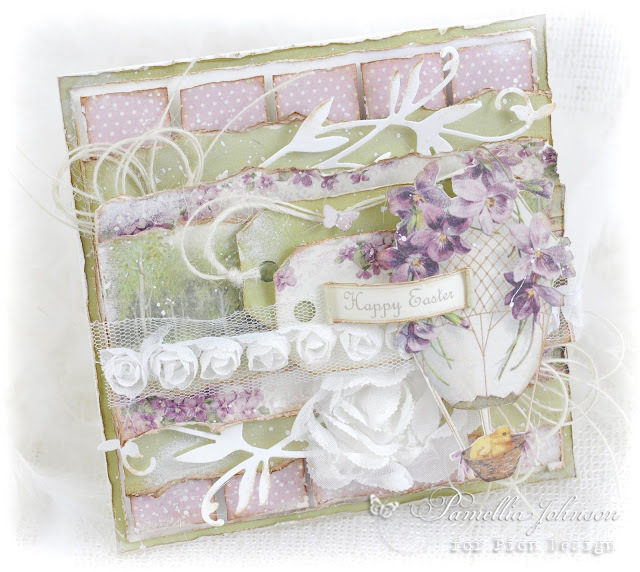 Absolutely charming spring colours and layers - a really gorgeous card. So stunning Pamellia..I love your videos...the dimension is just wonderful and you make cutting out look so easy with such big scissors..I love to see how you make your loops of twine that you poke in!...GORGEOUS. My dear Pamellia, I am so grateful to finally be here... please know I am doing my best. I will be leaving you Pion love soon, too. :o) I see we are equally in love with this collection! It is my favorite ever. You are showcasing these beauties to perfection. The layering is stunning and the airiness you always accomplish is quite breathtaking. How I LOVE that sweet hot air balloon image! Everything in Easter Greetings just makes my heart happy. I love every week layering you've created, be it paper, trims, or floral delights. Thank you for always inspiring me far richer than I could ever express. Tonight I will be treating myself to you last couple of videos. I am so eager. :o) Stunning as always, my sweet friend, and oh how I LOVE your nature pictures! Even raccoons love you to sparkly bits.. you moved to the most perfect location. :o) **dreamy sigh** How I love your posts! GORGEOUS!!! Wow, you just continue to deliver! So. so pretty! The Pion papers are exquisite!!! The soft colors, the layering and texture are simply incredible! I LOVE everything about it!! I love all the pic's, especially the raccoon! Oh my gosh, that would have freaked me out! He is trying to figure out a plan to win you over like those darling squirrels have, lol! Stunning card Pamellia! I just finished watching the video on YouTube and gave it thumb up :) Marvelous work!!! You make it look so easy to make a shabby chic card! It takes me hours to make a card, figuring out embellishments, design and colors...well we obviously are not all talented as you are my dear. Bravo is all I can say! Love your card, violets are just wonderful, did you know it's supposed to be a perfume that people can't remember even though it is a beautiful perfume? LOVE your birds, we are trying to attract different species, but they seem to visit once and don't return more is the shame. Sorry haven't commented before, but you may know I have been "poorly baard"
Totally exquisite card Pamellia....fabulous layers and details in stunning violet. Pamellia, this card is exquisite! So feminine and dainty! I love the violas! Hope your Easter was beautiful! You will find me popping on and going back to old posts hopefully for the next few days at least Pamellia. I have been ill and have really missed your beautiful creations and your exploits with the locals. I just adore your art anyways and I have fallen in love reading about your visitors as I've always had a soft spot for birds and squirrels and I have missed these posts. Thank you soo much for taking part in our "Easter/Spring" challenge over at Come and Get it.